Clifton House is an large Victorian country home and it was the substantial space provided by its rooms and grounds that drew Crispian and Denise Strachan there. 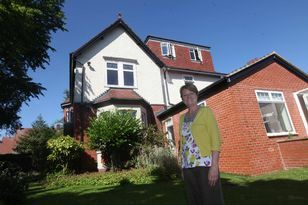 They moved to the house, in Clifton near Morpeth, in 1998 to bring up their four children: “They’ve all now flown the nest and gone around the world,” said Crispian. “We’re downsizing – we will decide where we’ll move to once we’ve sold here. It’s perfectly possible we will stay in the area. Having been here for 16 years we have a lot of life in the area and friends here, which is very nice. “We were first attracted by the sheer space and grace of the house, there was space for the children to play in. Clifton House was built in 1865, explained Crispian: “It was built by Mr Slater, the farmer at Clifton Farm at that time. He obviously wanted a grander farmhouse than the rather older construction which is still behind us and which is someone else’s family home. Therefore, he bought the plans from a farmer at Ponteland who had built a similar house and he built this one here in rather nicer style. The house impresses from the outset, with a stunning entrance bounded by stone pillars and walls and double gates leading to the open courtyard and parking area. Inside it has elegant reception rooms which have beautiful period features such as solid plaster work, ceiling roses and original doors. Some of the old fireplaces were removed by the Strachans to eliminate draughts but fireplaces remain in the lounge and dining room where the couple burn logs. Apart from putting in double glazing, central heating and solar panels, they have done little else in the way of improvements. The landscaped gardens are a feature of the house and, along with a meadow, cover just over one-and-a-half acres. Crispian said: “It’s a pleasure to walk in the gardens, whether it’s the walled garden which has its original box hedging or in the more formal parts at the front. Despite the grandeur of the home, it is conveniently placed for amenities. Clifton House, Clifton, Morpeth, is for sale at £850,000 through Sanderson Young, tel: 0191 223 3500.